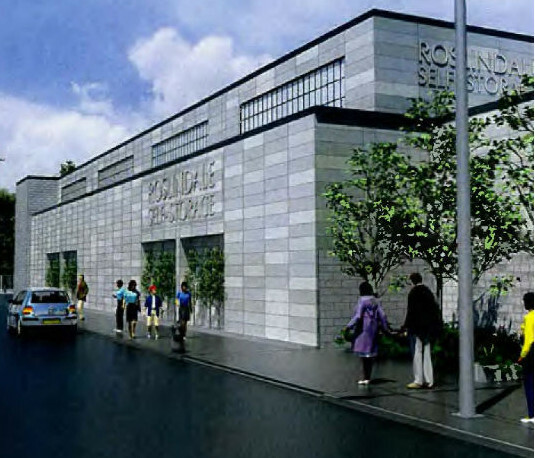 Last week, we sent a letter to the Boston Board of Appeal in support of a proposed expansion of a self-service storage facility at 44 Lochdale Road (just off Washington Street near Forest Hills). The full letter is reproduced below. Although we typically focus on housing and retail that will improve street-level vitality and walkability, off-site storage also has its place in vibrant urban neighborhoods, particularly as density increases and some folks chose to live in smaller units and thus need some overflow space. We also see the proposal as a substantial improvement over current conditions; for these reasons, we sent the letter below. Having received our letter and encountering no opposition (at least at the hearing), the Board of Appeal approved the requested zoning variations on July 25, 2017. We’ve seen some of this in our own neighborhood, like the street mural at Conway and South. Where else in Roslindale should we consider this? Ideas welcome in the comments! The high cost of free parking – Take 6 minutes and watch this video on parking. NOW! After you view this video at vox, featuring Don Shoup from UCLA, I hope you’ll be, like me, a Shoupista, when it comes to how we handle our parking here in Boston and really everywhere. And note that Boston hasn’t done what it should on point 1, but we are trying point 2. Enjoy! Neighborhood Slow Streets Announcement Made! And Rozzie has a winner!! We last discussed the NSS program under Vision Zero back at the end of March, when 47 applications, 4 of them from our beloved patch of soil, were submitted. At that time, we thought only 2 areas in the city would be selected. 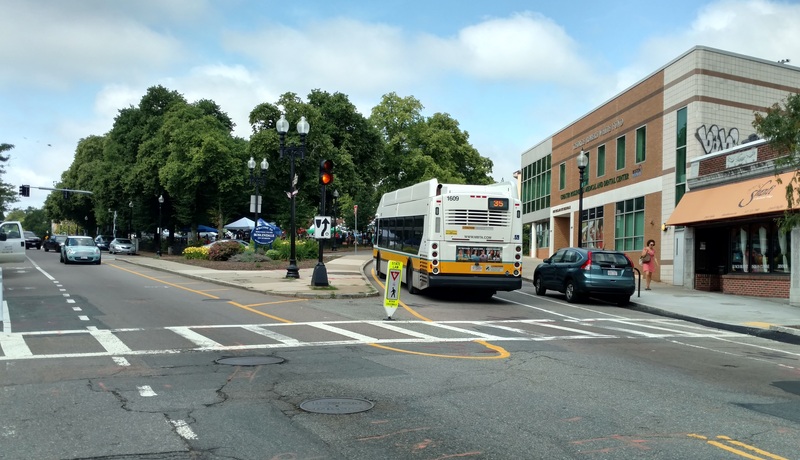 In the interim, the city found additional money for 3 more areas, so yesterday…drum roll…BTD announced 5 selected areas, one of which is the Mount Hope/Canterbury area in the eastern section of Roslindale. Congratulations to the champions of that effort, including WalkUP Roslindale’s own Lisa Beatman and Rick Yoder! You can find the city’s official announcement here, and a Boston Globe article from today here. We are excited by this opportunity to improve street safety and slow traffic in our neighborhood and look forward to working with Lisa, Rick, their neighbors in MH/C, and BTD staff to get this done as soon as humanly possible. As we have said many times at this blog and elsewhere, everyone in this city deserves to live on a safe street. Everyone on every street in every neighborhood. 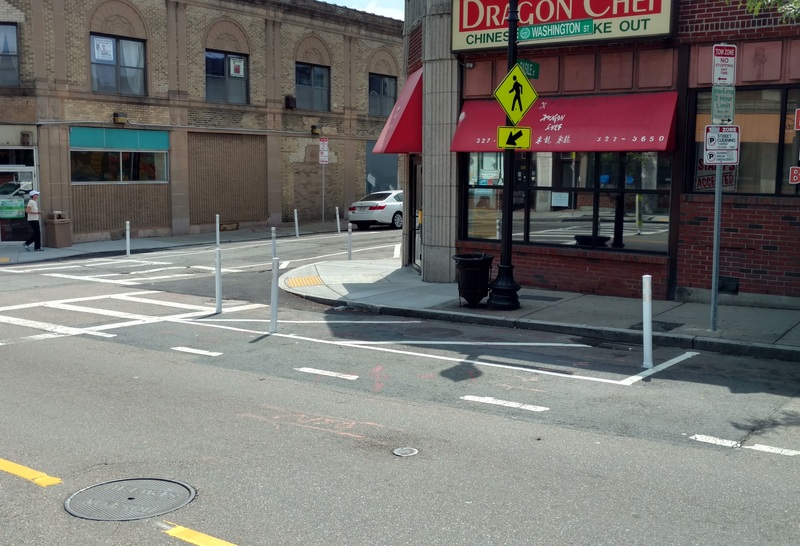 Crossing at Washington & Basile gets some attention and we are thrilled and appreciative! 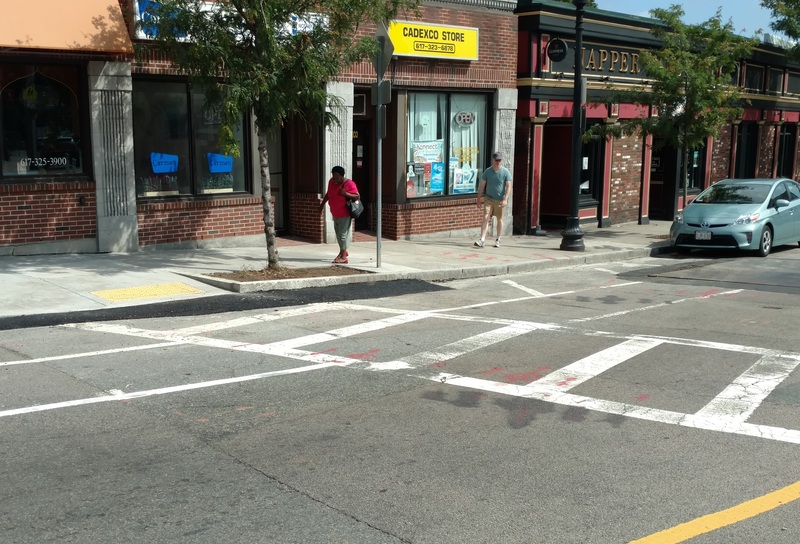 We know WalkUP Roslindale’s walk audit in December 2015 wasn’t the first time members of our neighborhood identified the crosswalk at the intersection of Washington and Basile streets as being in need of safety improvements. Indeed, we recognized at at the time that we were joining a long line of activists who had already called for changes at this important crossing at the northern entrance to Roslindale Square that is the main access point from the west for students going to and from the Sumner School. It was accordingly great to see city contractors out at this intersection in the last few weeks and days reinforcing the recently signed no-parking/standing areas adjacent to the crosswalk, installing curb-ramps, fixing the flashing yellow light, and installing the pedestrian crossing bollard and flexposts in almost all the required areas (the area right on the southbound side is, we believe, awaiting the completion of utility work before flexposts will go in). We all recognize that there is more work to be done throughout the square and the entire neighborhood to improve walking and cycling and overall safety for all users of our streets. But we will pause for this moment to thank everyone who had a hand this, starting with walkBoston, who took us through the walk audit, and including the Mayor’s Office for Neighborhood Services, Councilors McCarthy and Wu, the Boston Transportation and Public Works Departments, and Roslindale Village Main Street.